The profile piece is by no means a train wreck. How the heck do you make the print edition of a glossy monthly magazine relevant to the Faster Pussycat! Scroll! Scroll! mobile crowd? Well, one way is to allow the subject of a profile piece to annotate the print pages in the margins, screen grab those pages and share. Apatow gets endearing belly laughs on Twitter (when the subject is not Cosby). He gets them on screen. And here, he gets them in the margins. 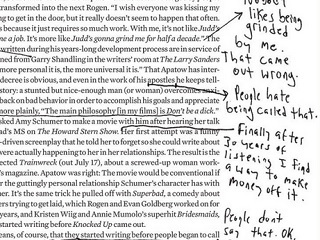 Kudos to the editors of Esquire for giving Hollywood’s court jester black-marker free rein.